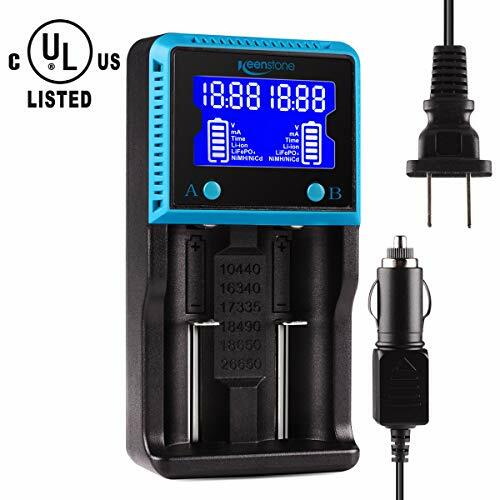 UNIVERSAL CHARGER: Li-ion LiFePO4 IMR INR ICR 26650 25500 22650 18650 18490 18500 18350 17670 16340 RCR123 14500 10440 Batteries, Ni-MH Ni-Cd A AA AAA AAAA C SC Batteries. LCD DISPLAY: LCD display to monitor the two slots information. Each battery parameter such as voltage (V), current (mA), time (h) can be showed independently by pressing the A/B button. SAFETY PERFORMANCE: Compliant standard - UL cUL CE TUV GS PSE FCC RoHS C-TICKCB. Built-in intelligent circuits protection to protect the battery safety charged. MULTI CHARGE OPTIONS: 2 independently slots, 2 charge curent (500mA,1000mA), meet your different needs at the same time.